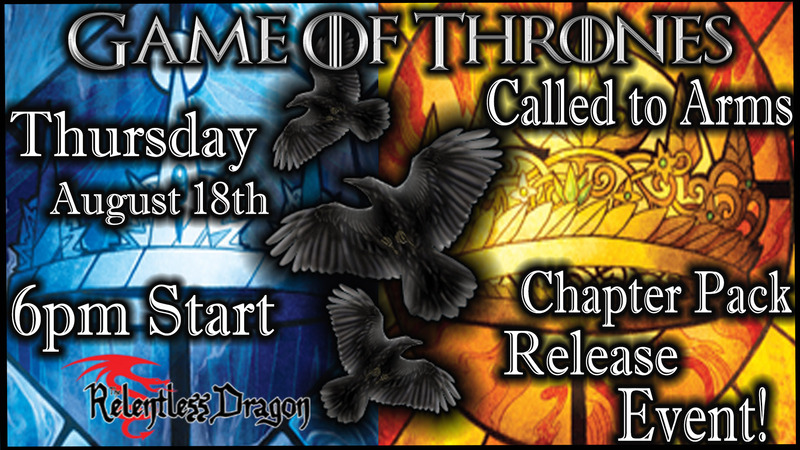 Join us on Thursday evening, August 18th to celebrate the release of the newest Chapter Pack for the Game of Thrones Living Card Game, Called to Arms. Registration opens at 5pm and the event begins at 6pm. The cost to enter is $5. Any cards from the “Called to Arms” chapter pack will not be legal in decks for this event. The winner of this event will receive a free copy of the new chapter pack and for every three players we get after the fourth player we will add another chapter pack to the prize pool! Additional prizes from the Game of Thrones LCG Summer Kit will be available as well.